I'm not one to spend a lot of money on headphones. To put it bluntly, I find them unbelievably uncomfortable and find myself wearing them for around five minutes at a time. When my boyfriend told me he was buying my younger sister a pair of earmuff headphones for Christmas, I laughed. A fun novelty gift. But then Christmas day arrived and she gave them a go. They were so comfy, and the quality was fab! So as I was lurking around the local shops last Thursday I popped into the O2 store to find one pair left. Instantly mine. They have made listening to music so much more comfortable for me, and although I'd feel a bit ridiculous walking around outside with them on, I have no problem wearing them around the house. Plus - toasty ears? An added bonus! 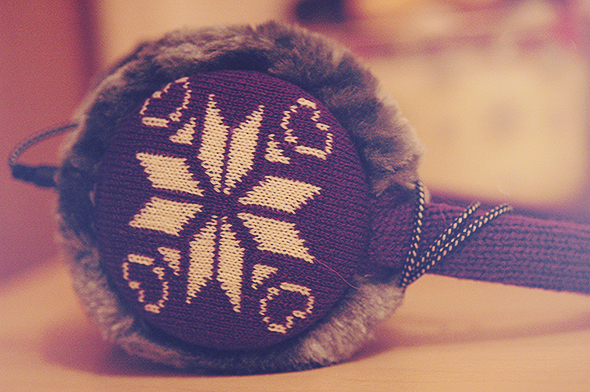 Do you have a pair of earmuff headphones? What do you think? Haha! I have so many problems with in ear headphones it's unreal, but these are great! aaaw!! those are soo cute! I've never seen anything like it in canada!